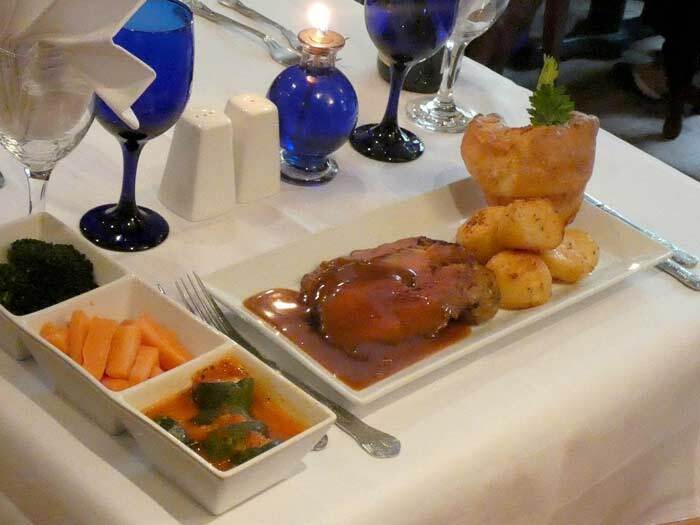 Enjoy a choice of meats each week, freshly roasted every Sunday morning and served with seasonal vegetables, Yorkshires, roast potatoes and gravy all homemade by our chef on the premises. Please make your server aware of any food allergies when placing your order. Lively, clean and expressive with a soft, approachable, subtle flavour. Glamorous and elegant, summer berry Champagne. Full flavour with a long, fruity aftertaste. A most distinguished Champagne. Over 20 years are required to make a bottle of Krug Champagne Cuvee, the result is the finest, most daring Champagne in the world. Soft, silky, exotic & luxurious flavours - a truly stunning experience. Clear appearance with a honeyed nose. Intense and rounded flavours with some mineral notes and balanced fruit character. Delicate bready aromas with harmonious flavours of mature apple and fresh fruit. A very stylish vintage, traditional method, quality sparkling wine. Gentle fruit and lovely length. The hand picked Chardonnay is whole-bunch pressed and fermented in stainless steel. 32 months prior to disgorgement. 100% Pinot Noir, a fantastic example of a cool climate Pinot. Light to medium body, full of red cherry and hints of cedar wood. Pairs extremely well with chicken, rabbit, game birds, pork and duck. Benchmark kiwi Sauvignon showing exuberant gooseberry notes with a medium body and clean crisp acidity. Luscious mango and dandelion aromas with a fleshy peachy body. underlying hint of vegetal and leather aromas. an abundance of fruit character developing into a long and full finish. Wonderful full flavoured medium dry from Northern Spain. Gentle coral pink colour. Crisp dry flavour with hints of berry fruit. Delicious Provencal Rosé with fruit and floral character and crisp acidity. Delicate, dry Rosé with lifted ripe summer fruit. Superb, single estate bottled wine. Fresh and zesty. with good citrus fruit intensity and a long finish. Lemon and lime nose with green apple fruit and a salty finish. Dry, crisp and fresh with essential Sauvignon flavour. aged beautifully and is drinking perfectly now. Dry, fruity and refreshing and right next door to Rioja. undertones and a long and smooth aftertaste. Crisp, refreshing Sauvignon laden with classic gooseberry and citrus apple flavours. Opulent and rich, this wine is fresh and clean with a floral nose and hints of fresh apples and lemons. Concentrated green citrus aromas with an underlying hint of flint and a rich supporting backbone. Fresh apricot and white peach flavours with good intensity and a long aftertaste. Notes of acacia and honey on the nose, lovely mouth feel and a long integrated finish. A round and powerful wine that can truly be described as full bodied classic Burgundy. Young approachable Spanish red bursting with ripe fruit flavours. Syrah, Grenache and Carignan, deep in colour with warmth and spicy flavours. Soft, accessible Tempranillo, ripe red fruit with great balance. Refined, delicate wine with violet and redcurrant aromas. Intense colour, spice and chocolate on the nose. A structured palate with vanilla tones and a hint of oak. Beautifully rounded, soft red fruit driven wine with clean acidity and a long finish. Youthful red fruit with good intensity and a structured length. Made up of mainly Merlot, soft, red fruit driven wine with good integration. Deep structure with rich bouquet and elegant, vibrant fruit flavour. Full bodied, rich and plummy with spicy blackcurrant. Silky bold black fruit with lovely intensity and a long textured finish. Tempranillo and Garnacha grapes traditionally matured in oak barrels. A lovely bright cherry red. Spicy cloves on the nose with a wonderfully refined black cherry and plum fruitiness. 100% Sangiovese grape. Well balanced wine, full bodied with great integration, cleansing acidity and a long full finish. Made from the Orange Muscat grape, it has aromas reminiscent of orange blossom and a gentle natural sweetness. Aromas of roses, and a full, sweet berry flavoured palate that beautifully compliments a variety of desserts and blue cheeses. An indulgent blend of Tempranillo and premium chocolate flavours.